All life's battles teach us something, even those we lose.... you'll discover that you have defended lies, deceived yourself, or suffered for foolishness. If you're a good warrior, you will not blame yourself for this, but neither will you allow your mistakes to repeat themselves. The Fifth Mountain by Paulo Coelho was published in 1996 and was his fourth major publication. The story is based on the story of Elijah from the Hebrew Bible (1 Kings chapters 17-19). The focus is on Elijah's time in Zarephath (in this book named Akbar). Much has been added to the simple Bible story by Coelho, including Elijah witnessing the sacking of Akbar by the Assyrians, Elijah's journey up the Fifth Mountain itself (said to be the dwelling place of Baal), and Elijah's falling in love with the widow to whom God sent him. This story may be considered religious in focus, despite a strong focus on the theme of rebellion against God. In this book, Coelho has explored the manner in which the prophetic questioning of authority, rebellion and liberation, and 'thinking for oneself' are important in one's relationship with God and one's life work. At the same time the novel is a powerful metaphor of human self-confidence and strong desire for self-fulfillment by helping other humans. The protagonist finds ultimately the strength to overcome all misfortunes in himself - in his deeply human desire to help the others and to be creative. And he finds out that God is in his own heart. For a considerable portion of the story Elijah is very compliant, obeying everything God's angels say. Eventually he realizes that his destiny is not being chosen by him but by God. Ultimately he decides to do go by his own desires and will. In this way Coelho suggests that Elijah was able to reach an ultimate level of spiritual awareness and have the most powerful relationship with God. 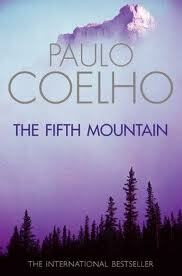 Must be an enjoyable read The Fifth Mountain: A Novel by Paulo Coelho. loved the way you wrote it. I find your review very genuine and original, this book is going in by "to read" list.